Smart homes; smart cities; smart motorways. The world’s newfound ‘smartness’ is generally attributable to what’s often called the ‘Internet of Things’ – or IoT for short. It’s that idea of cognition that sparks the imagination of innovators across a wide variety of industries. We’re increasingly seeing products that use sensors to recognise context and circumstance – and are able to adapt the way they work accordingly. And the potential is enormously exciting. The data these products generate, harness and share with each other, helps to create better consumer experiences, increasing the performance and efficiency of our ‘things,’ while ultimately making the world safer, greener and improving quality of life. Think of roads which can detect congestion and adverse weather conditions, implementing variable speed limits accordingly. Think of factories, like this one in Germany, with portable machinery which can detect inefficiencies and move itself along the production line to address inefficiencies and improve productivity. And, yes, think of HVAC products which can use their newfound cognition to work more efficiently, more effectively and more intuitively than has ever been possible before. In this article, we’ll talk about exactly how the IoT works for HVAC – and what we can expect to see in future. We’re still in the ‘first wave’ of the IoT revolution, but adoption is already making strides in the HVAC industry. Research suggests that 13% of US homes now own a smart thermostat, for example, and while it’s difficult to find comparative data for the European market, it’s difficult to imagine that penetration would be less, given the enormous popularity of products like Hive and Nest. It’s only the tip of the iceberg, but smart thermostats are a great example of how the IoT can add extra value to age-old products. 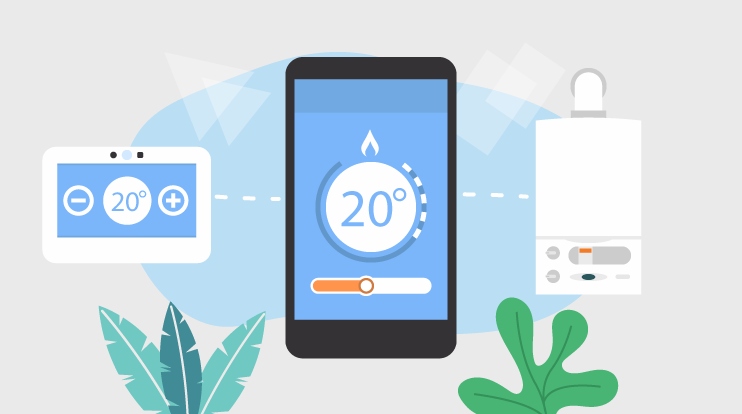 While central heating systems have historically worked on an on/off or timer basis, smart thermostats can be controlled remotely using a companion app on your smartphone. This means you can adjust the temperature of your home manually, wherever you are, as long as you have an internet connection. It’s incredibly convenient and can be a big energy-saver, as well, reducing the need for unnecessary usage. But that’s only the start. Products are increasingly able to make adjustments by themselves, with little or no human input. For example – some energy companies tailor the cost of power throughout the day, so it costs more when it’s in demand. Nest is able to take those prices into account when adjusting the temperature, delivering optimal comfort and cost savings for the user at the same time. ‘Connected’ HVAC products could also be a key player in the battle against polluted indoor air. In a world where indoor air pollution is 2-5 times worse than outdoor air – and air pollutants cause over 50,000 deaths per year in the US, as well as nearly 13,000 in the UK – the importance of clean air has, understandably, taken on great importance. Whereas once upon a time, an air purifier would have needed to be in constant operation, with little real intelligence for the user regarding its effectiveness, the IoT changes the game. Sensors fitted into air purifiers can turn them into truly ‘smart’ devices. They’re able to detect the level of pollution in the air, responding by cleaning the air in the most efficient way possible, saving on hours of constant, often unnecessary use. In simple terms, when people ask us ‘what’s the future of HVAC?’ We tell them, unequivocally – it’s all about smart devices, interpreting and measuring their environment, and responding accordingly to maximise human experience while optimising efficiency and product lifespan. 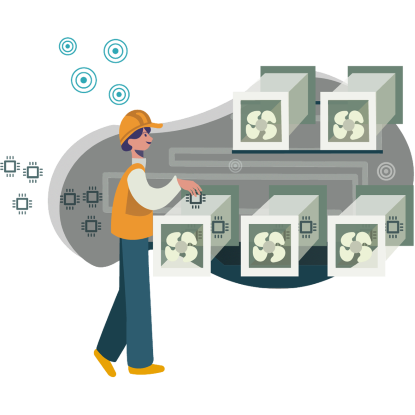 One of the most common misconceptions we see around the adoption of IoT into HVAC products is that it requires the (time-consuming and expensive) development of new products. This isn’t quite right. The combination of IoT and HVAC systems sees a number of different wireless sensors, smart vents and other technologies come together and add intelligence that helps the two communicate. And, of course, this means that existing HVAC products can be retrofitted with IoT connectivity, by incorporating the right sensors and software. When we think of ‘sensors’ we probably think of standalone devices, whose only purpose is to measure. The reality is, the IoT turns ‘things’ into sensors. Just as cars themselves could become the sensors on our smart motorways – capturing and communicating data around weather, road conditions and air quality – HVAC products could themselves become the sensors, springing into life as and when they’re required. And that’s not all. The sensor data enables HVAC systems to correctly adjust themselves with the relevant information, while the sensors also provide a trail of status’ that are helpful in terms of maintenance and repairs – which can then send alerts once a serious problem has been detected. Products can be measured and monitored in real-time, giving a clear and accurate picture of their performance – and identifying any issues with their performance in good time. Instead of arbitrarily servicing products at fixed periods, IoT allows problems to be identified before they become major issues, saving on repair bills and increasing the lifespan of your products. Where problems do occur, they can often be diagnosed remotely, saving customer callout fees. Since products aren’t required to work constantly – whether required or not – they’re able to deliver optimal results, whether it’s maintaining the right room temperature, or removing pollutants from the air, while using a fraction of the energy used by timer-based operation. A smart system can, for example, decrease ventilation flow when nobody’s inside the building – just one of the ways in which significant save energy can be saved. The idea of fully automated buildings isn’t a completely new one. The BACnet protocol – a data communication protocol for building automation and control networks – has been in development since 1987. But we’re increasingly seeing the emergence of new tech which makes the idea of the automated smart building a reality, rather than a futuristic vision. For HVAC products, IoT functionality gives them the power to communicate, share data with each other – and process that data into operating smarter, more efficiently, driving optimal efficiency across a range of products. The idea of standalone products working in isolation looks set to be left firmly in the past. We’re still in the ‘first wave’ of the IoT revolution, but already, the positive effects are being felt in industries like construction, transport – even parenthood. The HVAC industry is no exception, and for HVAC manufacturers, the opportunity is huge – and the stakes are high. It’s still early days and the potential for early adoption is an exciting proposition. For more on how to build faster connected devices, take a look at our technology page.